"Hangin' Out in the Holly"
Cardinals are the most devoted of songbirds. They mate for life. The male and female pair are always within sight of each other. While one is feeding the other always stands watch for predators. They both build the nest. While the female is hatching the eggs the male brings her food and guards the nest. Both bring food to the hatchlings. 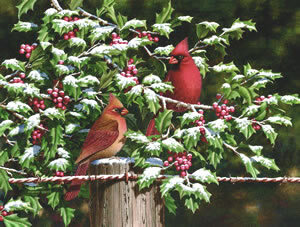 Cardinals do not migrate which is why you can see them, as Dempsey Essick has portrayed them, perched on a snowy holly branch in winter with their feathers fluffed up for warmth. Plentiful from Canada all the way to Central America, Cardinals can be found hanging out in gardens, yards and thickets all year. A favorite with Dempsey Essick, he lures the beautiful red birds to his yard with feeders full of sunflower seeds. "While doing this painting," Dempsey said, "I counted nine cardinals in the dogwood tree outside my studio window. I was always been attracted to the flashy red male, but then I began to notice how beautiful the female's buff reddish brown coloring is and now I pay just as much attention to the female. I loved the whole experience of creating this painting." Against the dark green of a holly bush shedding the final snow of winter, the two birds in the picture form the perfect image of a mated pair, at ease with each other and sure of the future. It is easy to imagine that the old fence post and wire are habitual resting spots and that there is a plan to build a nest behind the protective stickers of the holly leaves. Dempsey has done a masterful job depicting the rusty wire and weathered post in contrast with the shiny leaves of the holly bush which still shows the remnants of the last snow. Look closely at the foliage and you will discern the hidden image of a hummingbird worked into the overall design.